Another tack store is closing. This one is the nearest to us, well known and respected in the area. In a region once teeming with tack stores, it is sad to think that we will soon be down to one. Even that one is struggling under the weight of the new digital marketplace, where you can buy anything you want from anywhere you want. I see a time coming, not far in the future, when there will be no tack stores, except possibly in the richest areas, catering to the richest clients. “Would that be so bad?”, you might ask. Perhaps not, for those who never enjoyed the benefits of a great tack store – to my mind, it will be a great loss to us all. I remember the first time I visited a tack store. A friend drove us there, because we did not have a car. I was ten years old, and preparing for my first ever horse show, riding Delight, a mare I had fallen in love with at our university’s riding club. That first visit was to buy my first ever English style show shirt. 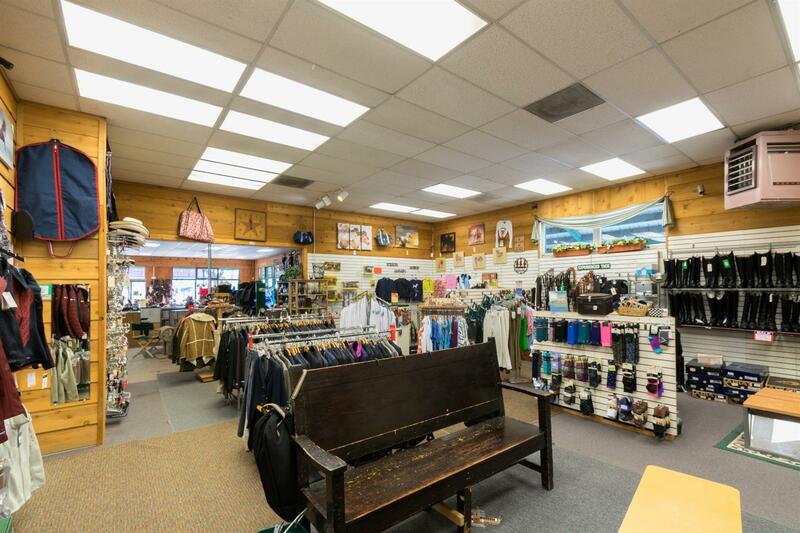 The store, Sacramento Saddlery, had been a local icon for many years – originally being located in the downtown area, later moving to the edge of town and a larger location. My first shirt, a halter for my first horse, my first show coat, my first clippers, my first custom boots – all came from Sacramento Saddlery. The owner was kind, knowledgeable, and helpful. He knew we had a very limited budget, and always helped us find the most affordable options for our needs. The family all got to know us so well over the years that they’d even look for us at the local shows. We would visit the store, and they would tell me how much they enjoyed watching us at the latest show. For a poor kid, trying to make it mostly on her own with the horse of a lifetime, that appreciation meant a lot! So familiar were they with us, that my veterinarian received a surprise when she went to purchase a Christmas present for me. She bought a leather halter for my Ben and was ordering a nameplate for it, when the woman behind the counter asked, “Oh, is that for THE Bendigo? !” That story made the gift all the more special! Another favorite tack store was much further away, but always worth the drive. Offutt’s was set up in the wing of a Victorian house in which the proprietors dwelled. It was a favorite destination, two to three times a year. Bargains could always be found, if you were willing to dig deep enough. Books, reins, bridles – some that had been in the store forever, because they never turned over old stock – were stacked deep around every corner. I once dug through the racks of reins, and found a pair for $7! Another family with deep ties to the horse industry, they were always helpful and just plain enjoyable to talk to. My first new saddle came from Offutt’s. Along with the store, Offutt’s had a mobile tack truck that came to all of the big shows in the area – long before anyone else was doing it. I will never forget being on my own at an A rated hunter show when my clippers started to fail. I was so frustrated that I couldn’t finish, and didn’t know what to do. Stopping in at Offutt’s, I was apparently visibly upset and Bob asked what was wrong. When I told him, he had me fetch my clippers. Cleaning, lubing, showing me a few tricks, and he had me back in business in no time. At other times he gave me free braid bands or yarn, if I ran out. Years later, a friend told me of a time when, as a teenager, she was at a show that suddenly turned very cold. Mr. Offutt saw her shivering, pulled out a winter coat from his racks, told her to put it on and return it the next day. Of course she did – such was the respect we all had for Bob. As you can see, tack store owners were a key part of the equestrian community. You could walk through the door with nearly any problem or need, and they would either have the answer or know where to get what you needed. Most had repair services for blankets and tack. I had billets replaced, and stitching repaired, at Silva’s Saddlery many times, since most of my early equipment was used. Sacramento Saddlery was the go to for clipper blade sharpening, and boot repairs. 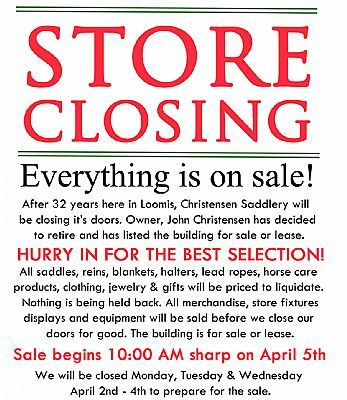 The store now closing, Christensen’s Saddlery, was just such as place. Staff were always friendly and ready to help. One of the key services they provided was help in selecting the right saddle. You could haul your horse to the store, get fitting assistance onsite, then ride in the saddles behind the store, before making the huge commitment to buy. The value of such a service, completely free to the customer, cannot be overstated. The store soon to be just a memory. When we walked through the door, on the second day of the closeout sale, the owner’s bid us “Good morning!” “It’s not such a ‘good’ morning,” I replied. When I explained that we were sad they were closing, the owner replied, “Blame Amazon!” Sadly, that is the key to the whole problem – so many people have fallen in love with online shopping that stores, large and small, just cannot compete. It is not all Amazon. The only other store in our region has received a lot of competition from Dover Saddlery, and other online tack suppliers. There is nothing wrong with shopping online. I started shopping from catalogs, in the days before the internet, for things where fit or feel might not be important. When internet shopping came along, I was certainly an early adopter – generally for items I could not easily find nearby. But I have never abandoned feed and tack stores. I want to feel the leather, know the boots are comfortable, and sit in the saddle. But I am increasingly in the minority. Tack stores have a significant overhead in the stock they must maintain, so the selection is rarely unlimited. With riders increasingly more interested in brands and specific styles of stitching and bling, it is nearly impossible to satisfy everyone. Life was simpler for tack stores when English tack and clothing was more function than fashion. Certainly the horse industry will survive without brick and mortar tack stores. Online catalogs abound, and free shipping is generally on offer with a big enough order. Still, I cannot help but think that we will lose an important social center, where equestrians can go to get advice and make friends. I know that I have a lifetime of cherished memories centered around tack stores, and will be sad when memories are all that is left. Be good to your horses … and visit a tack store to buy them something nice! This entry was posted in My Journey, Thinking Out Loud and tagged Amazon, Offutt's, online shopping, Sacramento Saddlery, Silva Saddlery, tack stores. Bookmark the permalink.